Introduction: Plasmodium vivax infection-associated hematological changes including severe anemia can cause significant morbidity and indirect mortality. Objective: The objective of the study is to analyze hematological changes in P. vivax malaria patients and to review pathogenesis and cause of death in P. vivax infection. Materials and Methods: During a 1-year period, patients who were screened and confirmed as P. vivax by quantitative buffy coat and peripheral smear were included in the study. The demographic details and hematological profile (hemoglobin, total white blood cell count, and platelet count) were correlated. The severity of anemia was graded based on hemoglobin and correlated with parasitemia. Results: Two hundred patients were included. Twelve of them in addition showed Plasmodium falciparum. Thrombocytopenia (74.5%) was a significant feature compared to anemia (4.5%) and leukopenia (20.5%). Only three patients had hemoglobin level <6 g%. One of them (4.3 g%) developed relapse. During relapse, he had hemolytic anemia which required transfusion. He died on follow-up. All patients were treated with the first-line antimalarial drugs. Conclusions: In view of the inherent biological characteristics, P. vivax is more difficult to eradicate than P. falciparum. The pathogenesis of anemia is multifactorial including mechanical processes and immune mechanisms which enhance removal of infected and uninfected cells. This probably leads to severe anemia in the patient who died. Malaria is a protozoan disease caused by Plasmodium species (Plasmodium falciparum, Plasmodium vivax, Plasmodium ovale, Plasmodium malariae, Plasmodium knowlesi) which are transmitted by bite of infected female Anopheles mosquitoes. It most commonly occurs throughout the tropics at the altitudes below 1500 meters. Malaria is one of the major health problems of the country. The mortality due to malaria annually in India is about 200,000. Out of total malaria cases, around 50% cases are due to P. falciparum. Among the rest of the cases, P. vivax is predominant followed by coinfection of P. falciparum and P. vivax. In recent years, P. vivax is increasing as an important cause for systemic complications and plays a significant role in these serious complications. This study was aimed to analyze the pattern of hematological changes in P. vivax malaria patients and to review the pathogenesis. The present study was done in patients who were screened on clinical examination during a 1-year period from July 2014 to June 2015. The diagnosis was confirmed by quantitative buffy coat (QBC) method. Peripheral smear was used to identify the species as either P. vivax or P. falciparum or both. The demographic details of patients were retrieved from the charts. Hematological profile, which included hemoglobin, total white blood cell (WBC) count, and platelet count, was performed using automated cell counter. Anemia was defined as hemoglobin <10 g/dl. The severity of anemia was graded as 8-10 g/dl (mild), 6-8 g/dl (moderate), and <6 g/dl (severe). Thrombocytopenia was defined as platelet count <150 × 10 9 /L. It was further graded as mild (<150-100 × 10 9 /L), moderate (<100-50 × 10 9 /L), and severe (<50 × 10 9 /L). When the total WBC count was <4000 cells/mm 3 , it was termed as leukopenia. The severity of the hematological changes was correlated with the type of species. All patients were treated with the first-line antimalarial drugs. A total of 200 patients diagnosed on QBC and peripheral blood smear with P. vivax malaria were included in the study. Out of 200, 12 of them in addition showed P. falciparum infection. The age of included patients ranged from 6 to 85 years. Age-wise distribution in the present study showed that 184 were adults (13-60 years), three in pediatric age, and 13 in geriatric age group. Male predominance (166) was observed compared to females (34) [Table 1]. Anemia was observed in nine patients. Only three patients had hemoglobin level <6 g/dl and minimum being 4.3 g/dl. One patient who was a migrant worker had moderate anemia of 8 g/dl. After 4 months, he was admitted to the hospital with hemoglobin of 4 g/dl. P. vivax infection was again confirmed. The peripheral smear showed features of hemolysis. The patient was treated with the first-line antimalarial drugs and packed red cell transfusion. The next day after admission, the patient died. Overall, 74.5% (149) of the patients had thrombocytopenia, which was mild in 18.0%, moderate in 46.5%, and profoundly low in 10% of cases. Leukopenia was observed in 41 (20.5%) patients, leukocytosis in only 3 (1.5%) patients. Total leukocyte count was normal in 144 (72%) patients [Table 2]. Anemia was noted in more than 50% cases in earlier studies on P. vivax malaria. ,,,, This is in contrast to the present study and parallel to reports of Patel et al. One patient with severe anemia (4.3 g%) developed relapse and at the time of relapse had hemolytic anemia which required blood transfusion. He died on follow-up. The pathogenesis of anemia in malaria is multifactorial and incompletely understood. It is thought to result from a combination of hemolysis of parasitized red blood cells (RBCs), accelerated removal of both parasitized and innocently unparasitized RBCs, depressed as well as ineffective erythropoiesis with dyserythropoietic changes and anemia of chronic disease. Other factors include red cell deformability, splenic phagocytosis, and/or pooling. Certain immunological factors also play a major role in development of anemia. Hemolytic anemia observed in the patient who died reflects the increased erythropoietic activity in the marrow which is due to compensatory erythroid hyperplasia. The occurrence of thrombocytopenia during the clinical course of P. falciparum has been consistently reported in different series. However, thrombocytopenia is infrequently reported for P. vivax malaria. In our study, almost two-thirds of patients developed thrombocytopenia and some developed severe thrombocytopenia (10%). Previous attempts to explain the occurrence of thrombocytopenia during P. falciparum and P. vivax infection involved decreased bone marrow production although this hypothesis was later ruled out. Rodríguez-Morales et al. and Muley A et al. reported thrombocytopenia in patients with P. vivax infection. , Leukopenia is common finding in both nonimmune and semi-immune patients. We observed leukopenia in 20.5% of patients. Leukopenia primarily reflects the state of hypersplenism. Recent studies have highlighted P. vivax as a cause of severe illness, most commonly associated with coma and convulsions, respiratory distress, and anemia. However, it remains unclear to what extent P. vivax directly contributes to severe morbidity, and other possible causes of clinical presentation need to be investigated before diagnosis of severe anemia is made. There are increasing reports of acute respiratory distress syndrome, glomerulonephritis, hepatitis, severe thrombocytopenia, and pancytopenia in association with P. vivax. The effects of chronic relapse due to dormant hypnozoites are extensive and debilitating and include chronic anemia. The trigger for relapse is poorly understood. Although P. vivax malaria is considered to be benign malaria, it has been increasingly reported to cause various manifestation of severe disease, with some reports of deaths. With increasing reports of drug resistance, this indeed is a cause for concern. Prompt and effective treatment and case management should be the same as for severe and complicated falciparum malaria. Malaria is still a major burden of disease in India associated with significant complications. Hematological changes related to malaria are known, but the changes vary with species, demographic factors, malaria immunity, and background of hemoglobinopathy. Anemia may be mild but may cause significant morbidity and occasional mortality in relapse. Thrombocytopenia is significant feature and the incidence is comparable to the reported literature. Both anemia and thrombocytopenia are multifactorial. Kashinkunti M, Alevoor S. Clinical, hematological and coagulation profile in malaria. Sch J Appl Med Sci 2014;2:584-8. Beeson JG, Chu CS, Richards JS, Nosten F, Fowkes FJ. Plasmodium vivax malaria: Challenges in diagnosis, treatment and elimination. Pediatr Infect Dis J 2015;34:529-31. Kumari M, Ghildiyal R. Clinical profile of Plasmodium vivax malaria in children and study of severity parameters in relation to mortality: A tertiary care centre perspective in Mumbai, India. Malar Res Treat 2014;2014:765657. Akhtar S, Gumashta R, Mahore S, Maimoon S. Hematological changes in malaria: A comparative study. IOSR J Pharm Biol Sci 2012;2:15-9. Agravat AH, Dhruva GA. Hematological changes in patients of malaria. J Cell Tissue Res 2010;10:2325-9. Gohil S, Mody P, Nimavat K. A haematological profile of malaria patients in a tertiary care hospital of Jamnagar district. GRA - Glob Res Analysis 2013;2:181-3. Patel A, Jain S, Patel B, Modi B. Hematological changes in P. falciparum and P. vivax malaria. Natl J Med Res 2013;3:130-3. Rodríguez-Morales AJ, Sánchez E, Vargas M, Piccolo C, Colina R, Arria M, et al. 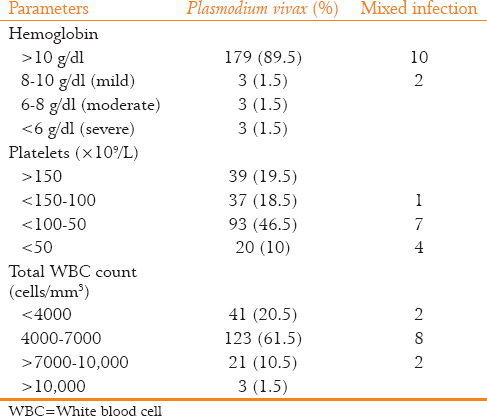 Occurrence of thrombocytopenia in Plasmodium vivax malaria. Clin Infect Dis 2005;41:130-1. Muley A, Lakhani J, Bhirud S, Patel A. Thrombocytopenia in Plasmodium vivax malaria: How significant? J Trop Med 2014;2014:567469.